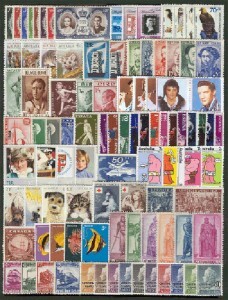 In terms of the topical information in stamp collecting, it is confident to say that the sky is the limit. Just about every imaginable topic has been depicted on stamps from unicorns to spacecraft. Love to play the piano? You might be interested in collecting pianos on stamps or famous composers or musical scores on stamps. Love your pit bull dog dearly? You might have pit bulls or dogs on stamps or pets on stamps. Love skiing? Then you might have Winter Olympics or skiing on stamps. Got interested? You could visit the American Topical Association (ATA) website where you can see all a wide array of different stamp collecting topics, from manatees, to robots, to opera, to Spies—you name it they’ve got it!